Coordinated actions by anarchists in the eve of Referendum against dictatorship and democracy.. Some anarchist groups in Istanbul, organized coordinated actions against democracy and dictatorship in the context of Turkish constitutional referendum, and to salute ‘Coordination of Anarchist Groups’, which was declared by some anarchist groups last week. Anarchist groups in the neighnourhoods of Kadıkoy, Kucukcekmece, Umraniye, Sefakoy, Kasımpasa dropped banners and made stickers simultaneously. “The simultaneous action in Istanbul Vodafone Arena Stadium and Maçka was conducted by our Team Martyr Tirej at 22:30 on 10 December, 2016. 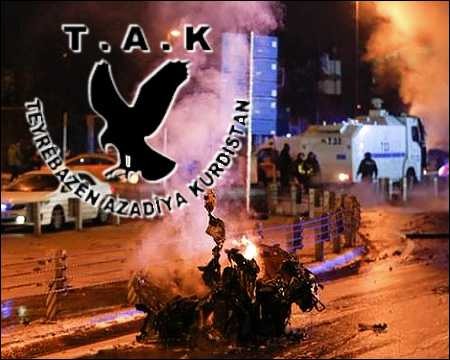 Two comrades of ours bravely fell martyr as a result of this action which left some 100 police dead and hundreds of others wounded.” The statement noted that ID details of these TAK militants will be announced in the coming days. TAK continued, stressing that: “The Turkish people are not a direct target of TAK. Our Team Martyr Tirej carried out this action with utmost attention. is right about his call to raise struggle. message from Osman Evcan and Hasan Çınar soon. ended by police attack after the public statement. that state, civilization and capitalism created. will be accepted as long as its limited by subsistence allowance”. Osman Evcan continues his indefinite hunger strike to protest Kocaeli no. him in a really short time period. Demolish the prisons, freedom to prisoners! We made this demo happen to show that we are not scared of the chains of the government capturing people, animals and earth. Our fight will continue against the systems will to include us to its decay. Everyone who is fighting to abolish oppression is a freedom fighter. We will continue our struggle until the political isolation of Osman Evcan (who is supporting total freedom, and who is fighting against repression and torture for his anarchist ideals) are over. Prison systems are coffins built to control the majority, and to pacify masses for the minorities interest. Until all cages and prisons are destroyed! There´s an anarchist place (infoshop,library,event space etc..) in Istanbul called “infiAl”. Islamist fascist Vahdet newspaper mobilized the police by publishing a report with the title “Anarchist are preparing themselves for civil war” and police raided infiAl. When they came the first time (with guns, armored police cars etc) people in the place managed to keep them away but in the following days they came more prepared with a search warrant. They also arrested the lawyer who had the right to be there. 3 comrades (including the lawyer) were taken to the anti-terror department of the police station. They are charging the anarchists to be a member of an armed terrorist group’ with the charge of insults and threats against President Erdogan and other parliamentarians as well. The law says that the statements can be taken from the lawyer only by the Prosecutor. The other 2 comrades used the right to remain silent, that’s why also their statement must be taken by the prosecutor, which should be tomorrow. But they got released around 3am in the morning without the statements. On future dates they will be called to give their statements. We are familiar with Turkish state repression on every opposition. Once again they proved that they can do whatever they want, creating evidence, charges, arresting lawyers etc..
We will also continue updating about the forthcoming situations. Vatan Budak who was wounded in Suruç bombing passed away. We lost our comrade, Vatan Budak who was wounded in Suruç (Pirsus) bombing and in intensive care for 16 days. Vatan was the member of United Anarchist Attack. He is the 5th anarchist comrade killed in Suruç blast. His funeral took place today in Gaziosmanpaşa, İstanbul. This neighbourhood is predominantly fascist and his family is one of the few Kurdish families living there. Because of great threat of violence and danger to his family flags and banners were somehow restricted. They were fully displayed only in the cemetery, where speeches were made bidding him last farewell. He was buried under black and red flag. Different anarchist groups and individuals were present. Instead of a minute of silence – a whole life in struggle! One person was reported arrested on their way to the funeral, but we haven’t got more info. cities (Eskişehir Anarşi İnisiyatifi, Ankara Anarşi İnisiyatifi, İstanbul Anarşi İnisiyatifi ve Devrimci Anarşist Faaliyet), gathered in Eskişehir in a commemoration action for their comrades (Alper Sapan, Evrim Deniz Erol, Medali Barutçu) who were killed by suicide bomb in Suruç (Pirsus) last week. When anarchist gathered and started to march, police suddenly attack and arrested about 15 anarchists. It was the action of Anarchy Initiative which made an international call for solidarity action against Turkish fascist government. Also other groups, autonoms and individuals joined the action in Eskişehir. 24 07 2015 – Early morning today, police in whole of ‘Turkey’ conducted raids and had detained 251 people. In Istanbul only they have deployed 5000 policemen in coordiated action in districts of Bağcılar, Okmeydanı, Sultangazi, Küçükçekmece, Sarıyer, Gaziosmanpaşa, Kağıthane, Beyoğlu, Başakşehir, Eyüp. This was aimed mainly against DHKP-C, YDG-H members. During this operation in Bağcılar disrict, Günay Özarslan (DHKP-C) was killed. 15 people were detained in Mardin, 7 PKK members in Izmir, 10 YDG-H members in Bursa, two others in Van. In the prison for foreigners in Maltepe, the law has been abrogated. today 15.07.2015 the hunger strike already reached 21 days). Today in Kadıkoy, we marched in solidarity with prisoners in Greek prisons, who are in hunger strike since 2nd of March and who turn to death fast. During march, we chanted slogans: “Destroy Prisons, Free the Prisoners”, “Wage Slavery System will end with anarchy”, “Greetings to the comrades who are fighting and fallen”, “Insurrection, Revolution, Anarchy”. This action was finished in a peaceful way, but if something come over our comrades, we’ll turn the streets to hell. Berkin Elvan was a 15-year-old Turkish boy who was hit in the head by a tear-gas canister fired by a police officer in Istanbul, while the boy was out to buy bread for his family during the June 2013 Gezi park protests in Turkey. He died on March 11, 2014. Widespread demonstrations erupted following Berkin’s death. Gezi park remains heavily monitored by secret police. One year ago, murderous police killed our brother Berkin Elvan who was 15 years old. DAF was on the streets in the first year of his murder. We are not afraid of the murderers. We will keep on fighting. Murderous Police, Terrorist State will pay for these massacres. Berkin is here, We are here! On the first anniversary of the death of Berkin Elvan, the comrades from LAF (High School Anarchist Action) also opened a banner on the stairs of Gezi Park. On it was written the slogan “Berkin is here”. They poured red paint on the stairs to the Gezi Park, shouting “If the government is thirsty for blood, then take it.” Our 8 comrades were then assaulted, abused and taken into custody, handcuffed from the back. The reactionary-fascist Turkish Presidential Adviser and former Transport Minister, İlhami Yıldırım, was the target of an armed attack. Popular Fighters Group of the Maoist Communist Party has taken responsibility and will issue a full communique soon. Yıldırım’s driver was shot several times and his weapons were seized. Yıldırım escaped the vehicle. Long live the new internationalist armed struggle. Die Maoistische Kommunistische Partei hat sich zur in Çekmeköy, İstanbul stattgefundenen Aktion gegen den Leiter der örtlichen Rotmond Niederlassung [pendant zum westlichen Rotkreuz Anm.d.Ü.] İlhami Yıldırım bekannt.